is not always the truth !!! How about starting the day with some Dessert ????? ball to resemble a soft boiled egg yolk . few drops vanilla essence, 1/4 cup water. till the mixture thickens. Cool & use. Excellent!!! Cannot believe the yolks are made of papaya!! very cool!! Iam still laughing here.......... Very creative. awesome and cute and excellent presentation. the egg shells are looking too cute, loved the addition of papaya, a treat for starting april ! Looks awesome!! *Dumb question* - Once you break open the egg shells and drain them, do you simply wash them out with water? And then put the vanilla custard in? This IS a fun post!! But where have you been, Smita? I have missed you! What's been going on with you? Welcome back!!!! Wow very creative..papaya looks exactly prefect like the yolks na..awesome..
hahhahah.. i really loved it.. ur dessert was really really nice.. very creative..
in this way...I discovered yours and...it's awesome!!!!! luv the presentation,..egg looks so real,. @Simran - broke the shell open n thoroughly drained it with luke warm water , kept it in sun for a couple of hours to make the eggy smell vanish. If u still feel the eggy smell rinse a couple of times with water mixed with vinegar. How clever is that! Gorgeous photography, too! Oh~~this is fun! Wish I had seen this yesterday. I will for sure make this fun dessert next year :D Thank you thank you for the idea! This looks absolutely fun! Thanks for stopping by my blog! Look forward to reading and enjoying more posts! Following you back on GFC! Love it! :-) Love your blog and ideas! What is best to use - cooked or raw eggs? What an idea and great pictures too. 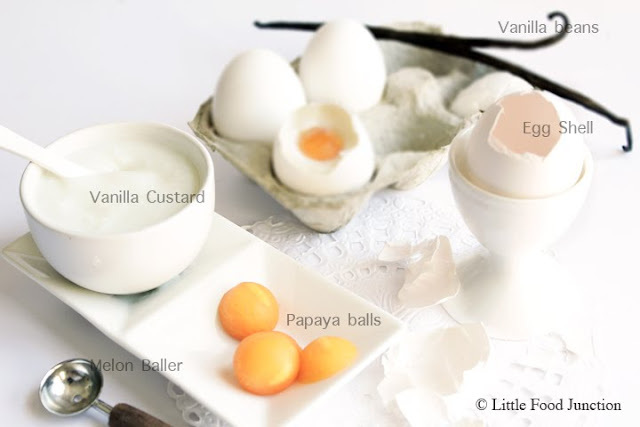 It is always a visual treat to come to your blog..
A perfect dessert for Fool's day. I make this with China grass instead of custard. Nice blog...I will visit again leisurely to see more recipes. PHOTOGRAPHS LOOKS LIKE A PROFESSIONAL ONE...VERY DECENT BLOG FILLED WITH VERY GOOD RECIPES.....Thanks for stopping by mine...glad to follow you.. Thanks for stopping by my blog. I love this recipe, very tricky and lots of fun! You've got a great site here. Nice and dleicious with vanilla custard and papaya. I got your comment on my blog today and am returning the favor and am following your blog thru GFC. Thanks for stopping by and following me. I appreciate each and every one of my followers. Have a great day! LOVE this! So dang cute! You are still delighting the masses! Congratulations on being featured in this sweet collection for April Fool's Day celebrations! I followed the links to find you, and what a pleasant surprise! Thanks for sharing.